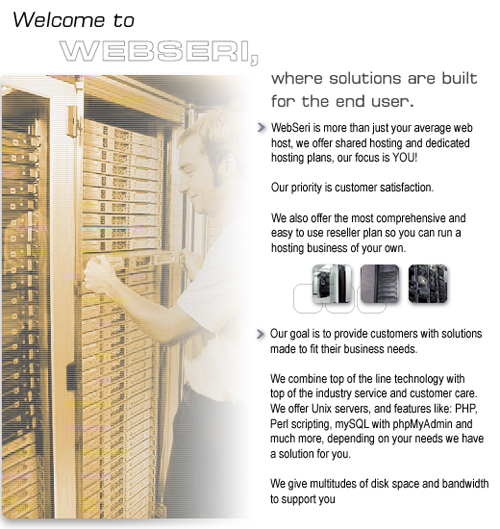 WEBSERI is a progressive internet company providing automated, easy to use solutions for customers looking for fast and efficient results. WEBSERI eliminates the need for professional web designers and programmers offering you a complete solution for your company's web presence. WEBSERI makes it effortless for you to find Internet tools and resources that put the command of the internet at your hands. Simply visit out partner sites to find the products and services you look for. At WEBSERI we believe in empowering our customers, which is why we partner with top quality Internet business solutions providers. Click on the links to find out more.